Though screen printing is the most efficient way of printing on textiles (check out my how-to here), it’s a lot of work to print a one-of-a-kind t-shirt. Here’s a cool way to create a stencil on the computer, and handprint it upon your shirt. It produces a different aesthetic than silk screening, as your completed shirt won’t look brand new, but nicely broken-in. 2. Create a duplicate layer, and using the eraser and the magic wand tool, isolate the subject from its background. I find it useful to use a solid fill layer in a bright color for contrast. 3. Force your image into pure black and white using Image->Adjustments->Threshold, and adjust the slider for the best balance of white and black. 4. Apply a blur using Filter->Blur->Gaussian Blur, with the radius in the low pixel range (.01-2), which smoothes out some of the pixelating from applying the Threshold. 5. Using the paintbrush tool, connect each black area to the larger black outline. No blob of black can stand alone, or it will be lost when you cut out the stencil. 6. Invert your image, and print it out on an 8.5 x 11” sheet of paper (a thick, high quality paper will do best). 1. Place the acetate atop the printed image, and secure the edges with masking tape. 2. Using the X-acto knife and a sharp blade, carefully cut out the (now) black part of the image. You should cut through both the acetate and the paper below it. Work slowly, and don’t be discouraged if you spend over an hour cutting your stencil. 3. To print your shirt, place your stencil as you wish, and tape the stencil down with masking tape. Adding newspaper to the uncovered fabric will also protect it from the ink. 4. Mix your ink color, adding in the fabric fixer if necessary. Unfortunately, you’ll use a lot of ink to fully saturate the roller, so be sure to mix a lot. (I wonder if a rubber brayer would work on fabric and cut down on wasted ink.) Test your stencil on a sheet of paper to get a feel for the process. 5. 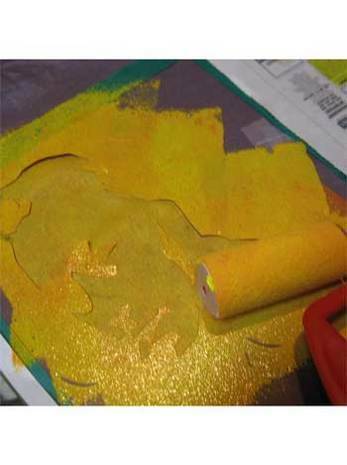 Fill the roller with ink, as you would when painting a wall, and then apply the ink atop your stencil, working in from the outside. It’s okay to do multiple coats, just be sure that the stencil doesn’t move. 6. Carefully remove the stencil, tape, and newspapers, and admire your good work. Let the ink dry, and then iron on a high, dry setting, using a piece of parchment or wax paper between the iron and the short, which heat-sets the ink. 7. Hand wash your shirt, and dry on a low setting, with some old towels to cut down on the agitation to the fabric. I added some nonsense to the front, just for kicks. Feel like making some more graphic art, this time for your wall? Then check this out. This is great work, I wanted to add one further tip. Acetate and glue is a great material for making reusable stencils, but if you're making a quick one-off there is another way. Buy some standard Freezer Paper for example Reynold's Freezer Paper. It's like wax paper but waxed on ony one side (this is important). Freezer Paper is thin enough you can trace through an image, and it's easier to cut than acetate. Once the stencil is cut place it wax-side down (i.e. onto the t-shirt) and dry iron it. This "glues" it into place quite firmly. You can then do the printing as normal and then remove the paper by pulling it. Handy if you're only after a quick one-off item. I love your description of how to make a cool stencil! I've been doing this process for a while, but I've always just downloaded stencils instead of making my own... I'll definitely be trying that soon! Also, I use freezer paper to print the stencil, then cut out the stencil and iron it onto the fabric... works pretty well! That is an interesting 'lived in' effect you can achieve using a stencil instead of a silk screen, but you have to admit the stencil will not last nearly as long as a silk screen will. This method would be good for one, or maybe even a handful of t-shirts, but no more than that. Thanks for the printing instructions. I just made a t-shirt. I sprayed the back of the stencil with "spray adhesive." It's the stuff on the back of Post-its. It works great to keep the stencil in place, and can be reused, just like Post-its. Hi Chris, I stumpled upon your videos. You simple rocked there. It was a great presentation with great thoughts and presentation style. Thanks for providing these insights. I was wondering how these shirts wear? How many washes etc??? Thank you so much for posting this. As soon as I read "acetate/ transparency paper" it jogged the old memory and I was able to solve my own stenciling need, My Duh! Thanks again. very nice, im working on mine now. thanks a ton. That is the clearest most direct directions for doing this that I've ever some across. Thanks! I love Camus just slightly more than those cool old Magnum photographs. Nice post. Kay-mus must be a pet peeve, huh? Bloody brilliant Bogey stencil. Makes me miss cigarettes. Have you seen banksy's stencils?